Translation:Are you coming or not? In this case if I want to answer with a "yes", i have to say " jo" (because its a negative question) or "ja"? This question is not negative as such, but a matter of two options. If asked this, I reckon a Swede would reply with "Ja, jag kommer" or "Nej, jag kommer inte" since it's not a yes/no question. Or even skip the ja/nej part and reply "Jag kommer" or "Jag kommer inte". Reminds me when i asked a teacher for a task "Should we do this? or should we do that?" he replied "Yes". This question in English expresses impatience as in "I thought you were coming but you haven't gotten ready to go so I say 'Are you coming or not?'" So to simply ask if some is coming without the impatience we would drop the "or not" else we would be considered rude. Does this question in Swedish have the same connotation? i wrote : you coming or not, and it was wrong. why is the "are" necessary here ? Because standard or common English needs it. @Zmrzlina In many cases the 'are' is understood in English. It that incorrect English? Generally, I don't want to see it as incorrect as much as non-standard. I know it's common to drop the verb in numerous dialects and sociolects though. By learning other languages through Duo, I do learn something new about English every week. Tack. That would be kommer du inte? What's wrong with "aren't you coming either?" That would be "Kommer inte du heller?" in Swedish. Can I say "eller hur"? That means "right", as in "You're coming, right?" Hi Duo! What is the difference between "Kommer du eller inte" and "Kommer du eller ej". Is the option with "ej" relevant in such case? How should we use "inte" and "ej" generally? Beträd ej gräsmattan! 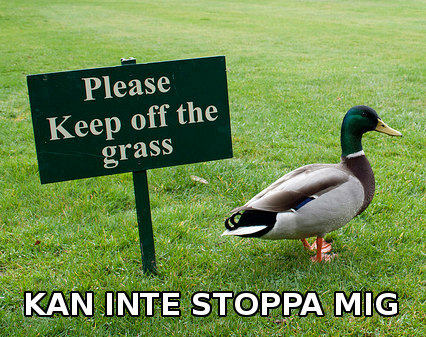 - Keep off the grass! how did you upload the picture? how do you say in Swedish: Do or don't you come? This translation was marked as not good. It wouldn't be correct in English. That's odd, but I still get audio and I haven't heard any other complaints about that happening regularly. So I'm hoping it's just a temporary glitch on your end.